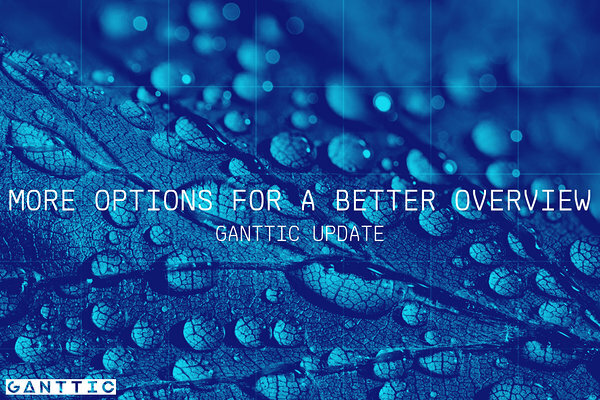 Ganttic is a resource management software that’s all about making sure you have all the tools to create the best possible overview of all of your resources’ workload and whereabouts. Be that allocating your team, freelancers, specialists, equipment, machinery or rooms. The resource management technique to use with those tools is matrix planning. Matrix planning takes the best of both resource and project management. It’s allocating tasks to resources while keeping an eye on the resource capacity and the project capacity. It’s making sure that the resources are allocated in a way that would maximize project efficiency but are still optimally utilized. It’s planning for one project and pivoting the resource plan to see the project portfolio. For matrix planning to work, you need to divide your general resource plan into manageable bits. Different location, departments, projects, etc. You need to build a system for it to work. You need to map out all the data you need to enter. You need to think about the different filtering and grouping options you could use. And once you do, you can easily pivot the resource planner to see the resource allocation from all the possible angles. You’ll have the overview and the control. The aim of high-level resource planning is to forecast, optimize and solve conflicts before they actually happen. To forecast, optimize, and solve conflicts, you need an overview of the resource allocation. It would be great if all of that could be done with one simple view with all the resources, a timeline, and some Gantt charts. However, if there are hundreds or even thousands of resources to plan, a single view just won’t do. Our capacity for processing information has limits. More precisely, our capacity is 7 (plus or minus two) units. Not hundreds of units. Not thousands of units. And since you still want to be the one that’s making decisions when things get critical, you need to be able to comprehend what’s going on in the first place. Creating views allows you to see the general resource plan from different perspectives. You can pinpoint the time slots where the resources are over-utilized. You can see the resources that aren’t utilized at all. You can track the workloads of specific departments or locations. You can make the unmanageable manageable. The fact that Gantt charts coupled with matrix planning can make your daily work a lot easier, is not the only reason they have made their way to resource management world. Gantt charts are also a good way to present information. Gantt charts can be used to make complex and detailed schedules visual. 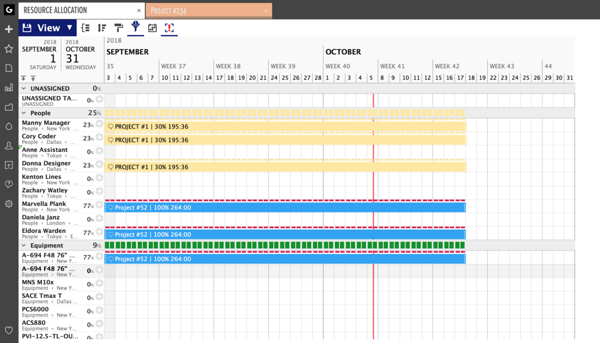 Gantt charts are easy to understand even for those that aren’t using them for planning on a daily basis. 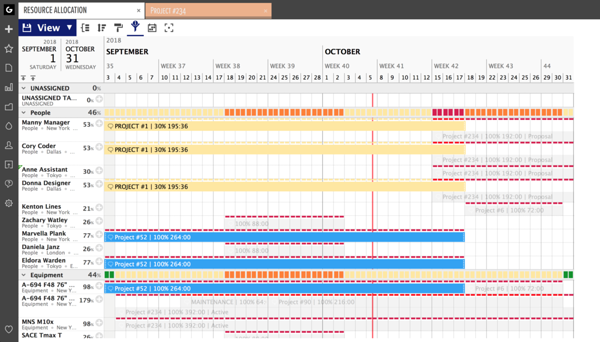 That’s why Gantt charts are often used to share the schedule with stakeholders and/or clients. The problem is that stakeholders and clients don't need to see which other projects the resources are working on. Even more so if that information is confidential and shouldn’t go out from the organization. While filtering and creating different views of the resources plan complemented with only displaying the resources that are connected to a specific project can minimize the problem, it still isn’t an ideal situation. To solve this problem and to give you yet another tool for creating a better overview, you can now choose if the grey taskbars are displayed or not. You can select if the taskbars that aren’t meeting the filter criteria or aren’t a part of the specific project are displayed or not. You can also choose the option to display the Gantt chart but not the data on the Gantt chart. In addition to a clearer overview, the update creates a possibility to view the resource utilization in the specific view. If you choose to hide the placeholders altogether, the resource utilization will be recalculated. If the placeholders are hidden, a warning sign will be displayed on the view parameters.